As the old saying goes, big things come in small packages. The converse of that idiom might have something to do with small things comprising something much larger. That is something Reinhard Öhlberger knows well. Reinhard Öhlberger, of Vienna, Austria (Wien, Österreich), has what arguably is the largest collection of its kind. 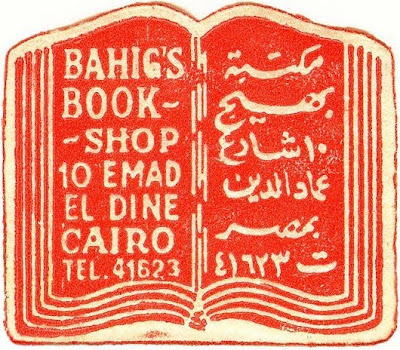 He collects bookseller labels--those small stamp-like pieces of paper booksellers used to paste onto the front or rear endpapers of a book to advertise their business. 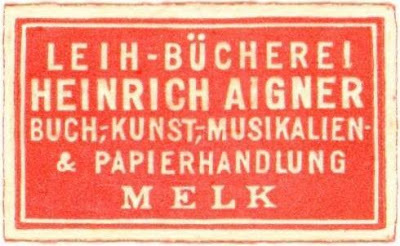 Mr. Öhlberger has, at last count, a little more than 24,000 of these labels (twenty-four thousand! ), also referred to as tickets. Given that number, there probably isn't any argument as to his collection being the largest of its kind. 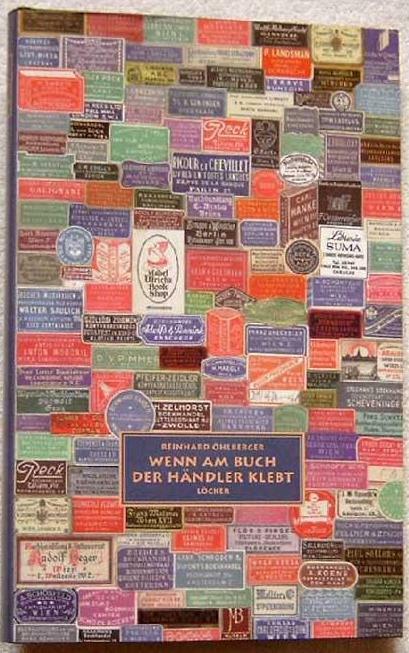 He chose about a thousand of these labels to feature in his book, Wenn am Buch der Händler klebt (Verlag Löcker, 1999). The image above is from Melzers Antiquarium (Luedenscheid, Germany) listing on abebooks.com. Mr. Öhlberger's generosity didn't end here. 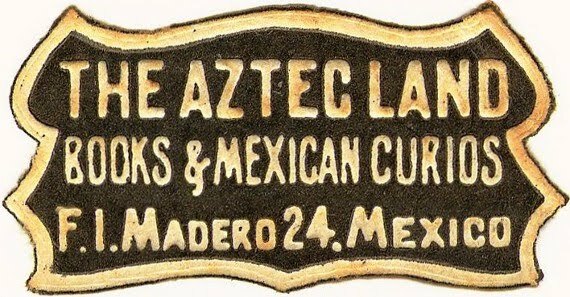 I was pleasantly surprised to find more labels from around the world in my inbox a day or two later. I'll keep them separated from these and present them in my next post. More cheap books on Nassau St. In my previous post, I wrote about a bookseller at 124 Nassau St. in New York City--Nathan Tibbals & Sons--whose trade card advertised cheap books. He made a point of repeating that line a few times to emphasize the low prices. I have evidence now that Tibbals had some competition a few doors down at 130 Nassau St.
Thomas O'Kane, a bookseller and publisher, was selling cheap books also, according to his bookseller label, which I just found yesterday and made part of my collection. How's that for a coincidence? 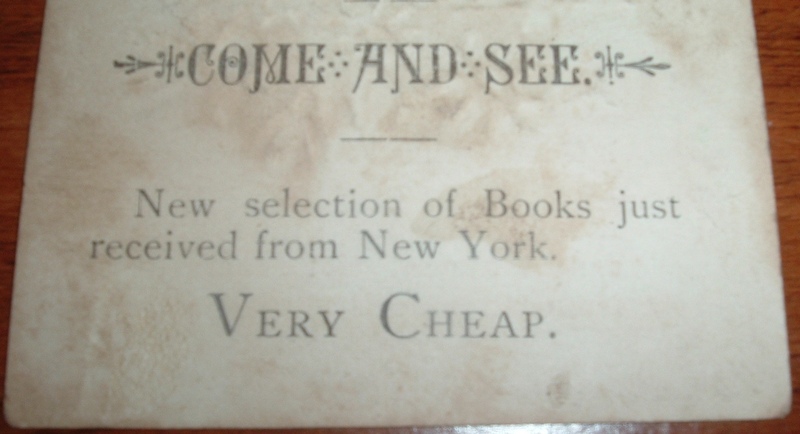 Write about one bookseller on Nassau St. in New York and a few days later learn about his neighbor in the same business, also selling cheap books. O'Kane's label and Tibbals' trade card look to be from the late 1800s so I make the assumption that they were in business about the same time. If so, book buyers must have loved that cheap little stretch of Nassau St! N. Tibbals & Sons have an agent in their New York basement at 124 Nassau St. So states the trade card for their publishing and bookselling business. 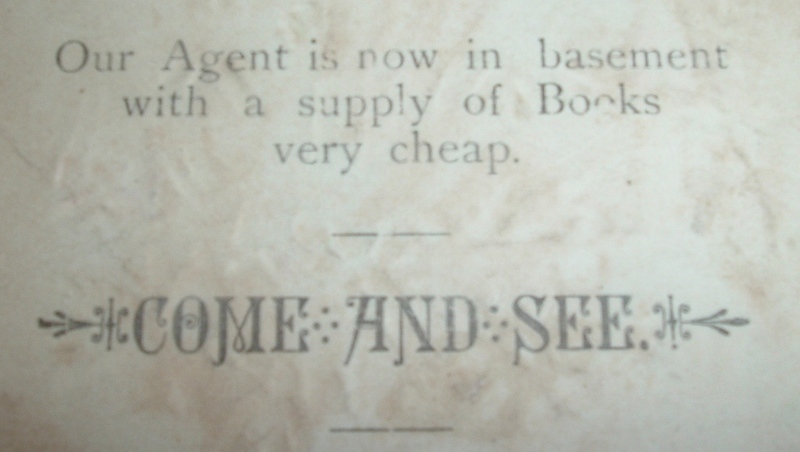 The back of the card states their agent is now in their basement with a bunch of very cheap books. And you need to come and see for yourself. These books have just come in from New York (Isn't Tibbals in New York?). And did they mention how cheap they are? 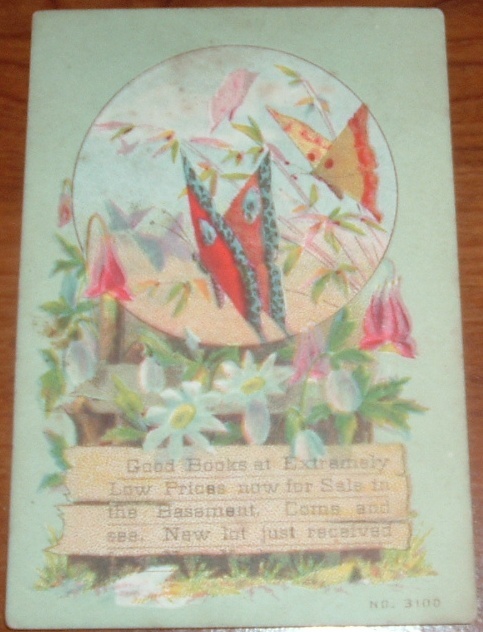 The front of the card has the typical colorful Victorian, flowery decor, this one with butterflies. These images seldom, if ever, have anything to do with the business indicated on the card. But this card reiterates the business pitch on the front also, not the business name. In case you missed the message on the flip side, these guys have a basement full of very cheap books to sell you. There's an agent down there, too. 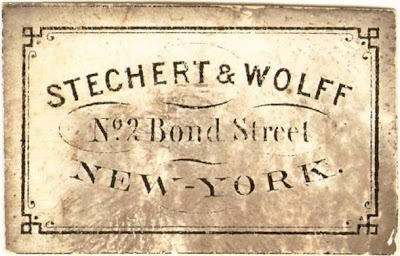 According to Publisher's Weekly, Volume 52, in an obituary for Nathan Tibbals, N. Tibbals & Son started in 1848 and conducted business for years at 37 Park Row in New York City, in the old World building. After a fire destroyed the building, and evidently not their books, N. Tibbal & Son moved to 26 Warren Street. 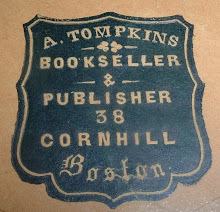 A name change for the company occurred in 1888, when they incorporated to become the Tibbals Book Company. Nathan Tibbals had nine children, but only one--a son named John A.J. Tibbals--joined the book business, hence the former name N. Tibbals & Son. 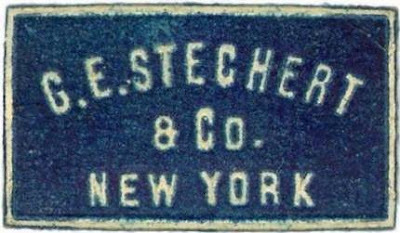 Information about the incorporation and name change in 1888 helps date the card to pre-1888. Based on that reported history, there are a couple of curiosities noted on their trade card. First, the name "& Sons" implies more than one. Maybe John wasn't the only son to join up with Nathan in the family business. Or maybe that's a misprint. The other curiosity is the street address. Publisher's Weekly offers two addresses--one before the fire and one after, neither of which are on Nassau St. 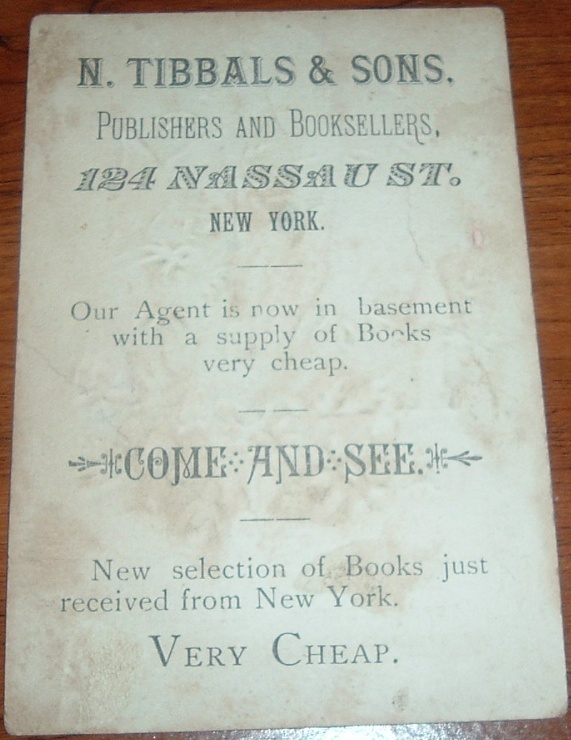 This trade card indicates there was at least one other address for the business--124 Nassau St (where they had an agent in the basement trying to unload some very cheap books). Over at the Thoughts of Bibliomaven blog, which has been far too silent this year (hint, hint, Cary...), there is an 1883 example of a Tibbals trade card with some additional history on the book company that takes it into the 20th century. 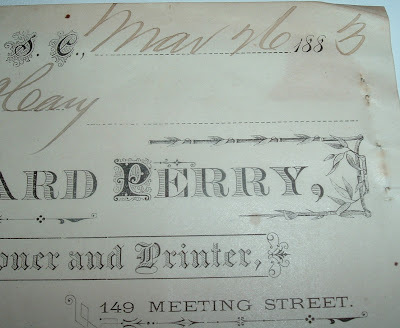 If you like exploring a book's provenance, you've probably channeled you inner genealogist at times to mine the clues provided in inscriptions and bookplates, or notes, letters, and other ephemera laid in. I use such clues often when researching a book's previous ownership. This is just a quick post to recommend a link to an enjoyable piece of writing on the subject. Over at the Book Tryst blog, Cokie G. Anderson has written an excellent article with some fine, albeit uncommon, examples of provenance discovery. Check it out for a little inspiration in your own sleuthing activities. I have a chromolithograph plate, for which I am trying to find the book it once illustrated. 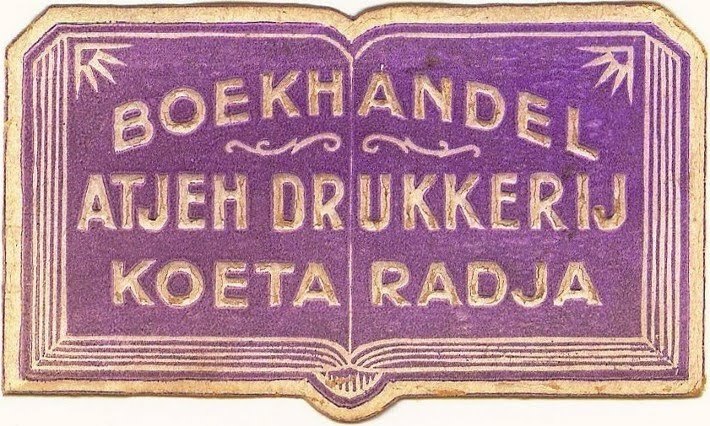 If I can properly identify the book, I'm sure I can find it. I blogged about this mystery three years ago, pre-Bibliophemera, dusted it off, and thought it appropriate content now for this venue. Close enough anyway. This plate was not created as a piece of ephemera, rather a lasting contribution to a book that should still be around somewhere. But separated from its book, this illustration had recently become thrift shop ephemera, which if not purchased may have wound up in the trash. I found the folio-size plate (12 X 17 inches) hanging in a resale shop several years ago and walked out with it for $7. Bargain? I don't know for sure (the dampstain doesn't help), but I do know that it reminded me of a trip to Belgium with my wife some years ago, walking through the old city of Bruges along the aged cobblestone streets, window shopping for chocolate and lace, which the area is known for. And so I'm sure sentimental reasons factored into the decision to make the purchase. That and I love a good bibliomystery! 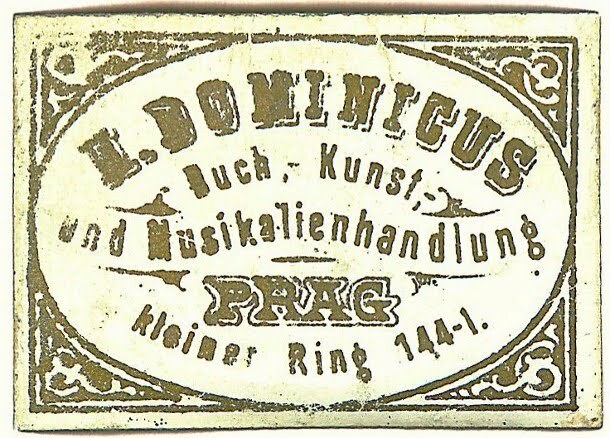 I wanted to know the antiquarian work from which this plate had been extracted. This information helped me locate a few copies of a book, or set of books, that may be a good candidate for having contained this plate: Masterpieces of Industrial Art & Sculpture at the International Exposition, 1862 (3-volume set), edited by J.B. Waring. 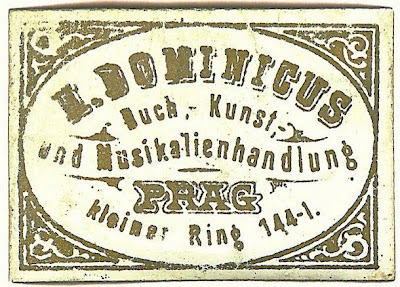 There are more than 300 chromolithograph plates in the set. 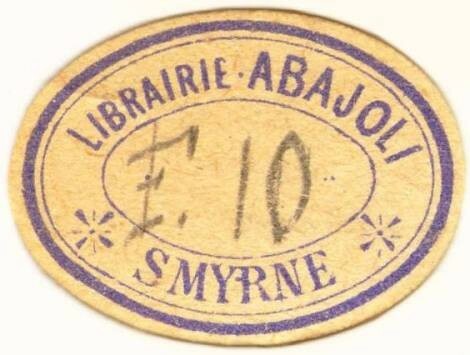 Other books I found were ruled out if the number of plates in the book were less than than 109, which is the number assigned to this plate. 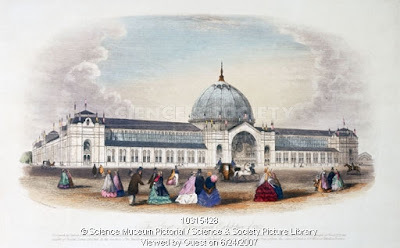 The International Exhibit was like a World's Fair exhibition of culture and industry taht began in 1851 in London and was held again in London in 1862. Images, like the one below, of the 1862 Exhibit can be found at the Science and Society Picture Library site. 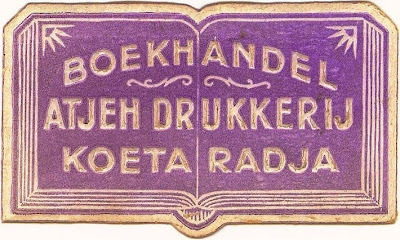 If indeed the above book does include the Brussels Lace, I may have even found the lithographer who actually did the chromolithographs for the book. Researching the International Exhibition of 1862 led me to a related book, Victorian Decorated Trade Bindings 1830-1880, by Edmund M.B. King, Oak Knoll Press (2003). An excerpt of the book referenced William Robert Tymms, artist and engraver, who created the chromolithographs for J. B. Waring’s Masterpieces of the Industrial Art & Sculpture at the International Exhibition, 1862. 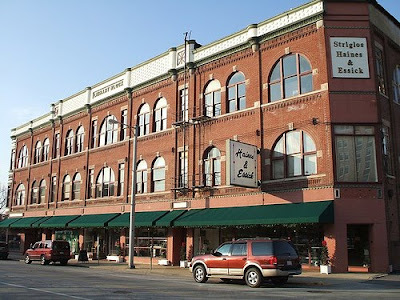 Sometime that same day, about a hundred miles or so up the road in Decatur, Illinois, a lawyer and future judge walked into the book shop, Haines and Essick, to hunt for some interesting treasure and walked out with Charles P. Everitt's The Adventures of a Treasure Hunter: A Rare Bookman in Search of American History. 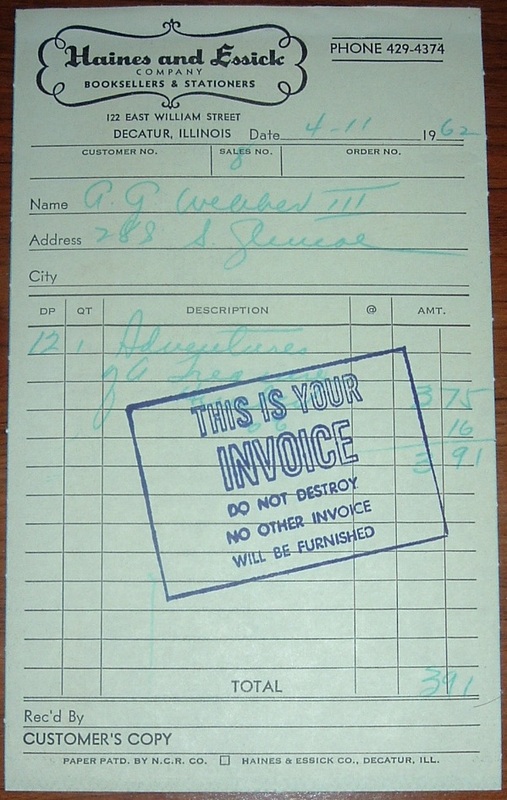 He left the invoice in his book, and years later both the book and its bookseller ephemera found their way into the hands of James Haselden, a Madison, Wisconsin bookseller, collector, reader, and book hunter--in short, a bibliophile(maniac?). Add excellent writer to that list and then check out what Bibliofisher has been finding on his treasure hunts via his blog: This Week in Book Hunting. If you're not familiar with this blog and Bibliofisher's finds on the book trail, hustle on over and get caught up with some vicarious discoveries. 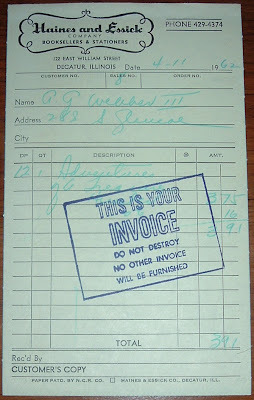 And now he's generously donated this invoice from one his discoveries to the Bibliophemera cause. From the Decatur newspaper Herald & Review archives, I learned that Haines & Essick was established in 1902 by Harry E. Haines and W. Roy Essick as a stationery store and bookstore, which evolved into both retail and textbook sales. They still exist more than a hundred years later, though in a much different form. Striglos is their parent company. Books are still part of their inventory, but apparently not a large part. They share space with toys, office supplies, and even a kitchen boutique (whatever that is) with cooking classes. I suppose there's potential there for a tie-in with an author who has a new cookbook out. Textbook sales are now with a sister company, Millikin Books (under the Striglos umbrella), which serves Decatur's Millikin University (history with a haunting twist!) student and faculty needs. 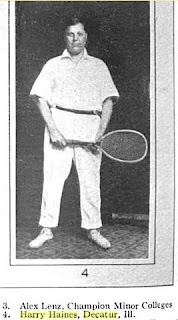 The Herald Review has the tennis history on Haines, but also reveals that he died in 1963 at age 92. Wonder if he was in the shop the year before when the judge stopped in and bought the Everitt book? Partner Essick was Walter Roy Essick, born in 1876 in Preston, Iowa. He worked as a bookkeeper before partnering with Haines in the bookselling business. I have no idea if Essick shared his partner's love of tennis, but Haines' interest in sports evidently included golf as well. From another Decatur news article, I learned about a golfing couple and the husband's passionate interest in the sport turning bibliophilic in more ways than one. 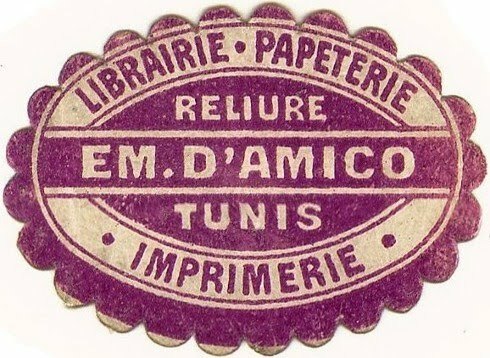 He acquired over time some 4,000 books about golf, the earliest titles circa 1880s. Yet even more interesting, perhaps, is his antique golf club collection because it includes a few 1920s era wooden-shafted ones stamped, "Haines & Essick." Yep, Haines & Essick, the booksellers. I see a first on two possible fronts here: 1) A bookselling firm who sold books and golf clubs with their brand on them and 2) A golfing bibliophile who has a book shop's golf clubs and maybe, just maybe, some of their books, too. Judge A.G. Webber III was a brilliant scholar. Friends said he arose at 5 a.m. each day to read the classics in Greek. 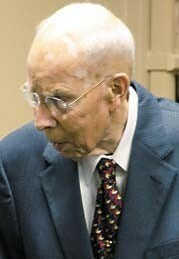 He was an outspoken member of the Decatur Book Club. "I remember well the first book I reviewed," he said. "It was 'Lady Chatterly's Lover' by D.H. Lawrence. The book had been banned previously. I had a pirated copy I picked up in China in 1945. It was a piece of trash." 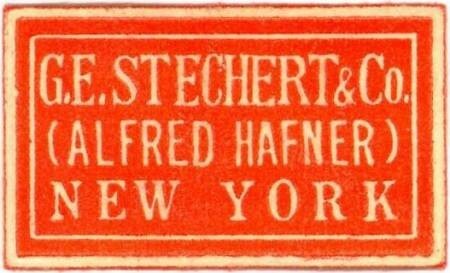 1987 retirement, he was a consultant for the law firm of Welch Kehart Shafter and Hughes, now known as Kehart Peckert and Booth. "He helped us in the office, and he wrote a history of our firm," Michael Kehart said. "He was a very smart fellow." Webber proved his writing ability by becoming a Herald & Review "Prairie Talk" essay writer during the early 1990s with a couple of humor pieces. He passed away in February 2009 and his estate was auctioned off to benefit the Millikin University Art Department. Among the items mentioned from Webber’s estate there was a large desk that once was in the administration offices of A.E. Staley Mfg. Co., an 1867 Tiffany, a 13-star flag, and a hand colored lithograph from the 1893 World’s Columbian Exposition in Chicago. Webber was certainly a collector of Americana, judging by these items and the book he bought from Haines and Essick, The Adventures of a Treasure Hunter: A Rare Bookman in Search of American History, certainly was a fitting purchase for his collecting interests. 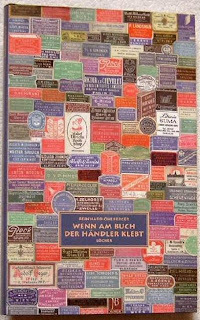 I am pleased to add a footnote to Kurt Zimmerman’s article, “Armchair Adventures: Ten Classic Accounts of American Book Collecting,” which appears in the November/December issue (#30) of your magazine. For those who do not insist on reading it in the first edition, The Adventures of a Treasure Hunter: A Rare Bookman in Search of American History by Charles P. Everitt is available in a trade paperback edition. I published the reprint in 1987, with an introduction by Jack Matthews. 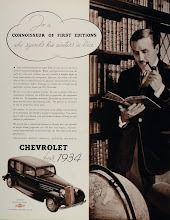 Everitt’s book was actually ghostwritten by Barrows Mussey, a book publisher and collector, who, in a letter to me, explained how the book was written: “My contract with [the publisher] Little, Brown included all the bourbon Charlie Everitt could drink, and in the course of writing I actually bought two or three cases of Old Grandad. 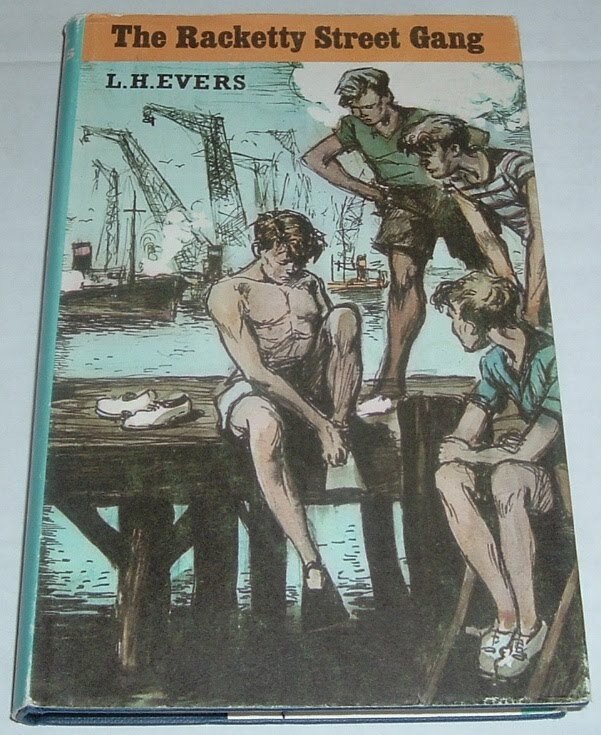 It was a relatively moral arrangement, because I, being a rum drinker, did not take more than a glass an evening of the private stock, for sociability.” Everitt’s book was published after his death in 1950 and was a selection of the Book-of-the-Month Club at the time. You gotta love that! I don't have a copy of Everitt's book, but after reading this, I want the 1987 reprint (in addition to a signed first someday) because I'm a big fan of Jack Matthews' writing. Book shops through the ages have often peddled more wares than just books. 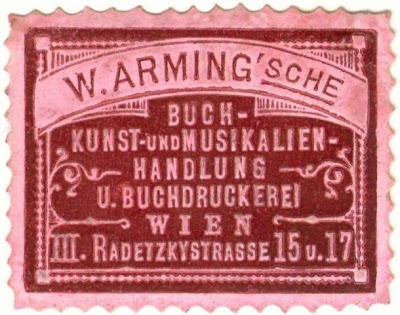 Writing instruments have usually been a popular addition to the book stock and, for at least one turn-of-the-century bookseller, that extended to typewriters. George Doll's company, Doll & Co., Booksellers & Stationers, of Knoxville Tennessee, had a diversified inventory, as evidenced by one of their old billheads from 1905. 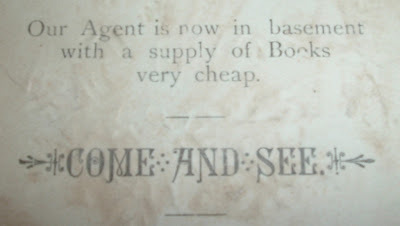 They were agents for typewriters, bookcases and office supplies. 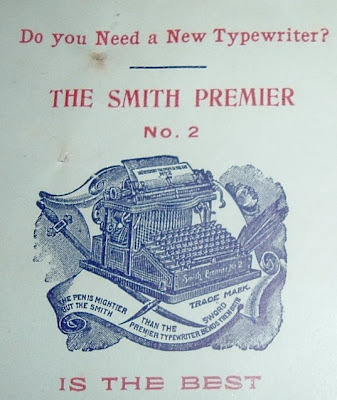 But the Smith Premier No. 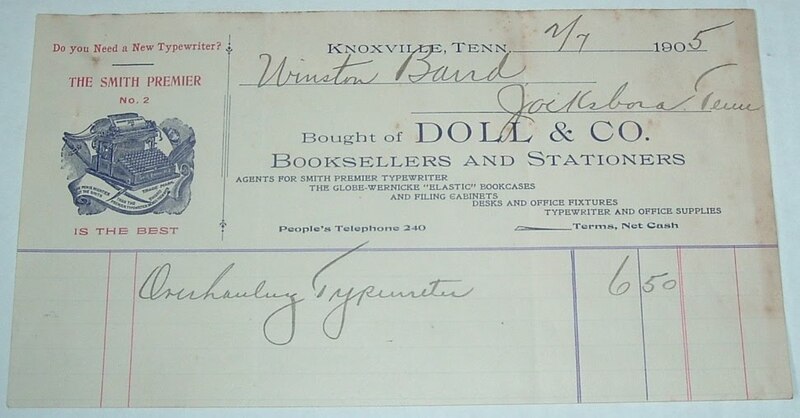 2 Typewriter gets the spotlight on this piece of business ephemera. It would also appear from the billhead that the bookseller offered repairs on the typewriters it sold. The transaction recorded indicates a customer from up the road in Jacksboro had his typewriter overhauled and was charged $6.50 for the service. There's more information about the history of Smith Premier typewriters HERE. Related blog posts include one from Bibliophemera from last year that features a billhead for a bookseller who sold "writing machines" and also Nicholas Basbane's most recent (this week) post on the Fine Books & Collectibles Magazine blog, dealing with discrimination against typewriter users today. 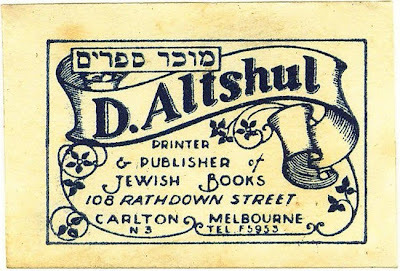 Here is a stapled booklet of bookplates for children, dated 1918. They were sold by Lloyd Adams Noble, Publisher. The booklet contains three different designs to choose from. Each page has three of the same bookplate in perforated panes with an adhesive on the back for moistening and applying to the book. A protective guard between each page prevented the bookplates from sticking to each other. This booklet is missing one bookplate at the back, otherwise it is completely intact with minimal wear despite its age and supposedly having been handled by children. 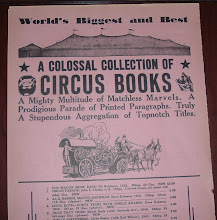 I have seen individual plates for sale from these booklets, but a whole booklet appears to be quite scarce. 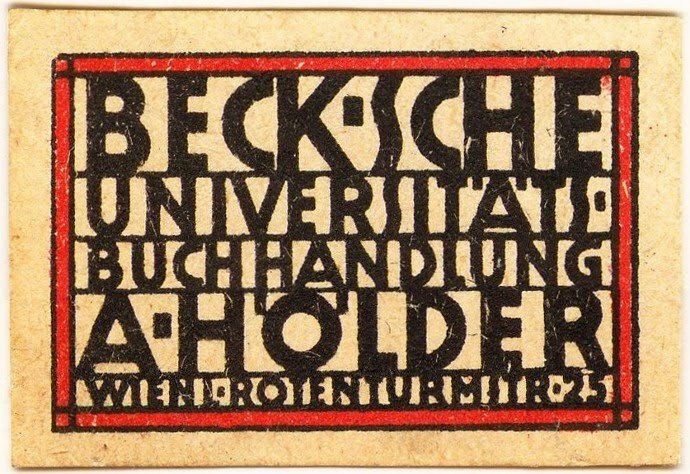 I'm not sure when this series of bookplates started or ended, but this set is copyrighted 1918 and I know the bookplates were still being published in 1921. A Lloyd Adams Noble title from that year, Pieces for Every Day the Schools Celebrate, by Deming and Bemis, contains ads in the back in which it is stated that three books of 36 bookplates each could be purchased for fifty cents. In addition to Bookplates My Older Children Love Best of All, there were bookplates for younger readers: Bookplates My Younger Children Love Best of All. You may be wondering, if you didn't click on the link at the beginning, if Noble were any relation to the Barnes & Noble booksellers. 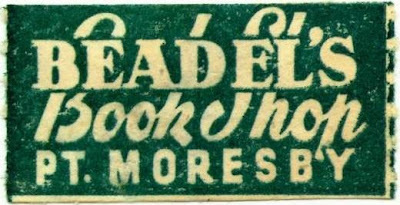 Noble was the son of Clifford Noble, a partner in Hinds & Noble, which would later become Barnes & Noble. The link at the beginning of this post tells of the Barnes & Noble lineage and includes Clifford Noble's efforts to help his son, Lloyd, get started in business. He helped him set up the publishing house, which enjoyed some success with several bestsellers until World War I intervened and the Noble boys (Lloyd and Kendrick) went off to war. Clifford struggled with his bookselling business as well as Lloyd's publishing business with his sons gone and eventually had to bring in a partner, William Barnes. 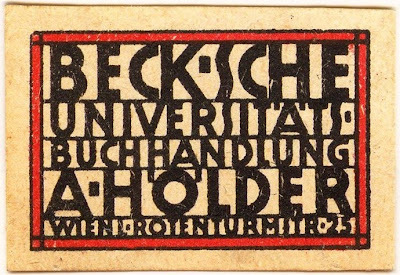 Lloyd returned to his publishing business after the war concluded in 1918 (the year this bookplate booklet was published) and Kendrick went to work elsewhere, though he returned to the family fold in 1921. At this point, the publishing firm changed its name to Noble & Noble. They made it through the Great Depression, which caused father Clifford to sell his share in Barnes & Noble to partner Barnes and concentrate on helping the publishing business. 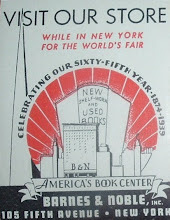 Noble & Noble Publishing thrived in the years following World War II and by 1965 the end came in the form of the company selling all its stock to Dell Publishing. 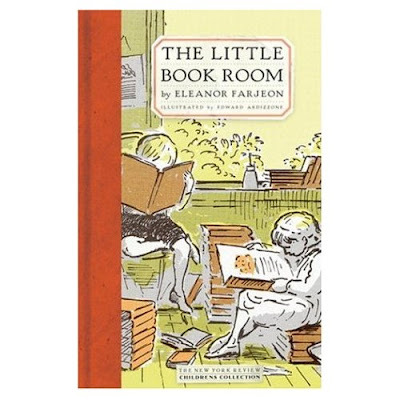 The Little Bookroom is Australia's first and, therefore, oldest children's specialist book shop. I learned this while cataloging books this morning and came across a copy of L.H. Evers' The Racketty Street Gang. 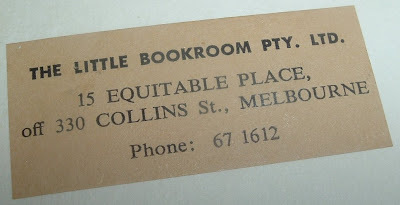 At the bottom of the front free endpaper was the bookseller's label, plain in design, but an invitation to discover a rich history of children's literature in Australia. 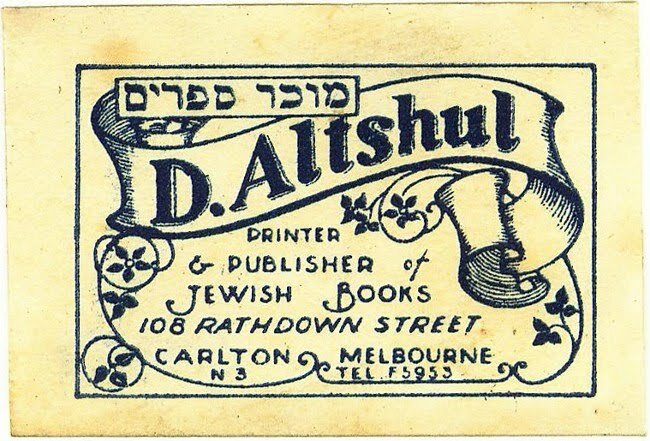 Founder Albert Ullin opened the doors to the Melbourne book shop, at the corner of Bourke and Elizabeth Streets, on Friday the 13th, 1960. Apparently not too superstitious about the date, "lucky 13" worked out pretty well, as the book shop has enjoyed 50 years of business. 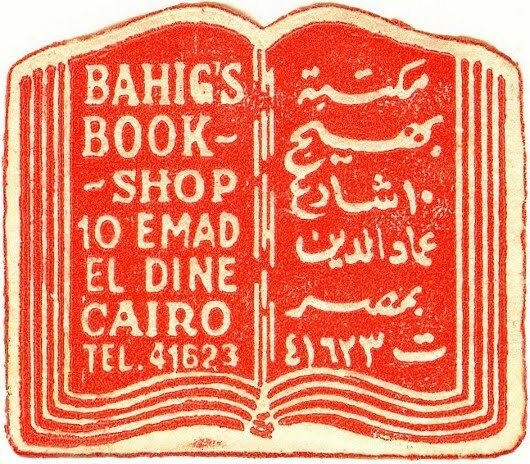 How many speciality book shops of the same vintage are still around to claim the same? Ullin named his shop for the title of an Eleanor Farjeon (of London) collection of short stories. In 1963, the Little Bookroom moved to the Equitable Place address printed on the bookseller label, where they stayed for the next 16 years. The shop now does business at 759 Nicholson Street, with all its original shelves having survived each move. There have been several owners, but it was Ullin's vision and bookselling experience that shaped the course the book shop would take and he was awarded numerous honors during his career, including the prestigious The Order of Australia Medal in 1997 for his services to children's literature in Australia and overseas. 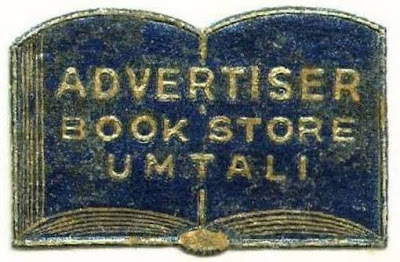 Here's an old bookseller's billhead from Charleston, South Carolina in 1883, which I find intriguing for its interesting and unexpected design. 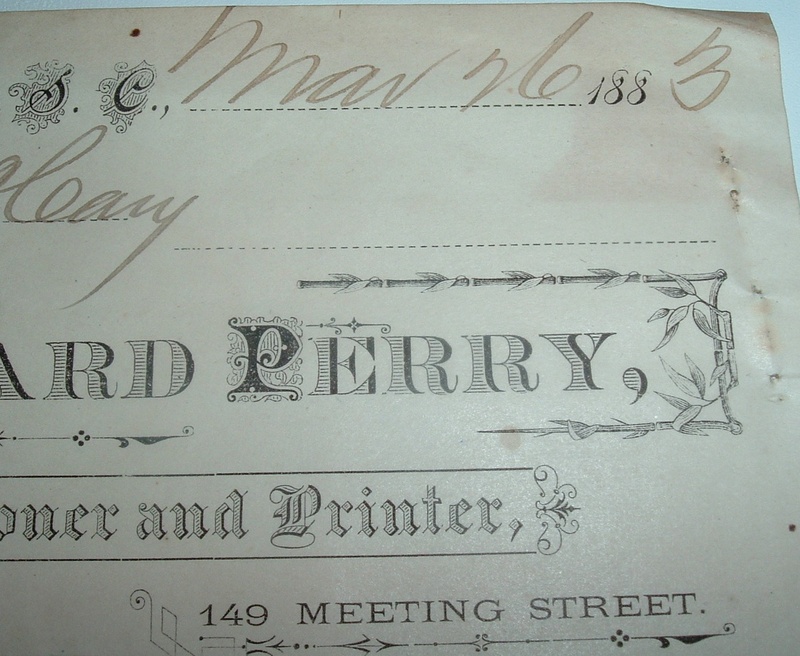 Edward Perry, Bookseller, Stationer, and Printer, is pretty much lost to history except for a few brief references to pamphlets he printed in Charleston. What is memorable about this billhead is the Chinese design that borders the top portion of the paper. Not quite what I would expect to find in an old colonial city of the American South (my ignorance of Charleston history). Curious about the choice of design, I wondered if it were just the peculiar personal taste of Perry or if a greater influence was at work here. A culturally influential Chinese aesthetic in 19th century Charleston did not come immediately to mind, but began to seep in as I entertained ideas about Perry's taste in Asian-inspired design. I had to make only a few queries online before finding my answer. The Society for Historical Archaeology, Volume 33, Number 3 (1999), contains an article by Robert A. Leath titled, "After the Chinese Taste:" Chinese Export Porcelain and Chinoisene Decoration in Eighteenth-Century Charleston. Chinese export porcelain is one of the most commonly found ceramics in the Charleston area, constituting as much as 24% of the overall ceramic assemblage at many archaeological sites. Chinese porcelain was but one pan, however, of a broader stylistic language known as Chinoiserie in the 18th century. As international trade expanded, the complete range of Asian export luxury goods silks, Indian cotton textiles, Chinese lacquer and hardwood furniture, Chinese wallpaper, and reverse paintings on glass popular throughout the European world. The European enthusiasm for Asian export goods inspired western designers both technologically the invention of porcelain stylistically, as they combined Asian and European motifs in whimsical, Chinese-inspired designs for architecture and interior decoration. The more ephemeral objects, such as textiles and wallpaper, rarely survive in the archaeological record, although their presence can be established in period newspaper advertisements and probate inventories. As one of the wealthiest cities and most active trading centers in 18th-century North America Charleston, South Carolina, provides rich documentation for the presence of Asian export luxury goods and Chinese-inspired designs in the American colonies. By importing these goods and ordering locally crafted objects in the Chinese taste, Charleston's colonial gentry demonstrated their ability to emulate their European counterparts and adapt the latest European fashion to their own domestic interiors. The line about Chinese-inspired designs for the more ephemeral objects would include a creative printer-bookseller's business papers such as billheads and letterheads. 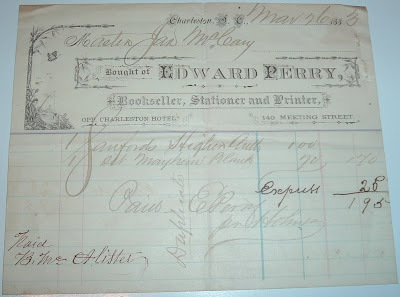 As such Charleston ephemera rarely survives in the archaeological record, according to Leath, I would suppose my Edward Perry billhead qualifies as rare. 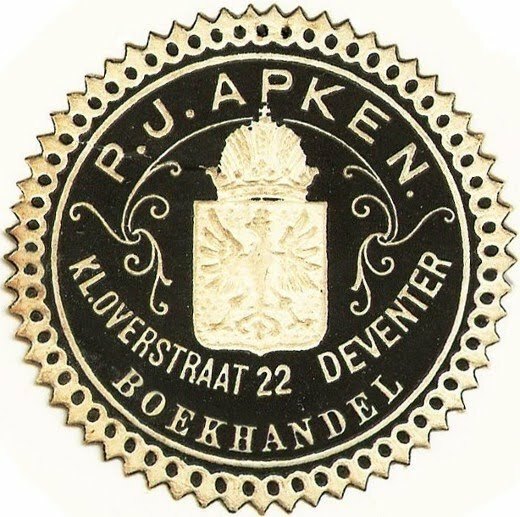 Equally rare, or unusual, in my estimation, is the fact that an 18th century influence survived well into the next century to influence the design of an ephemeral piece of business correspondence. 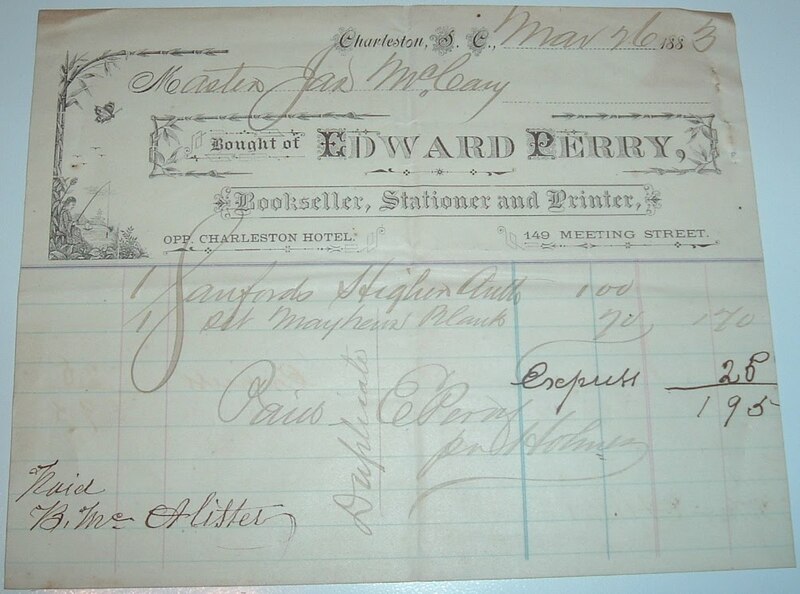 I can't help thinking about how many other businesses in 18th and 19th century Charleston were similarly influenced and how much of their ephemera has been lost.